A strange, mirror-like haze hangs over the horizon. Shimmering patterns of reflected light remind me of the images that filmmakers use to depict distant landscapes in the desert. Except, this is no desert. For an hour, the Marietta has been sailing southwest and, with the exception of a chain of small volcanic islands, there is no land in front of us – only the expansive Pacific Ocean. “Have you seen that haze before?” a member of the Flagship Cruises & Events crew asks. “It sure is unusual,” I reply as I try to recall nuggets of information about the physical properties of light and water that might help explain this visual illusion. I’m not able to contemplate the matter long; something along the horizon line catches my eye. About a mile away, white splashes are beginning to appear on an otherwise calm sea. I take a few steps backward from my position on the bridge to check in with the captain and make sure he’s seen it, too. Anticipating my question, he enthusiastically says, “Yep, that’s where we’re going. Dolphins, a lot of dolphins.” I resume my former vantage point and peer through my binoculars. More and more splashes, over a wider and wider area. Is my brain processing this correctly? Or is this another illusion, like the strange haze on the horizon? 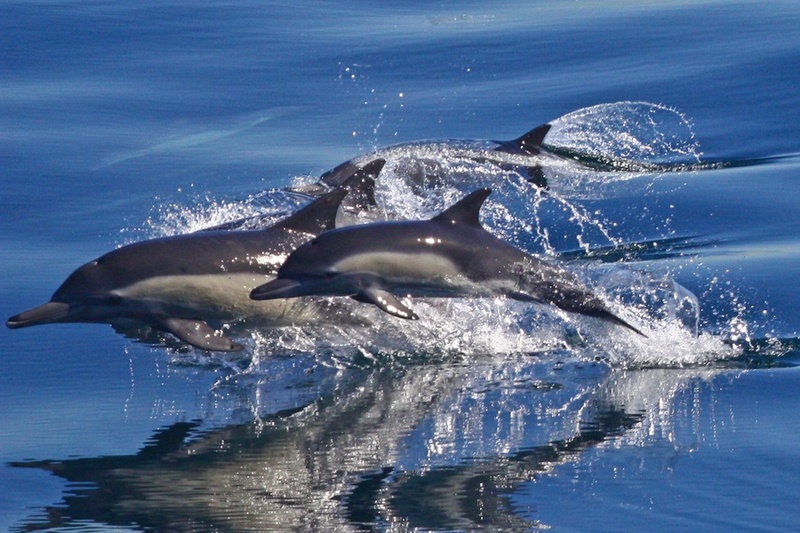 Passengers on a recent whale watching cruise were treated to a rare sight: a "megapod" of more than 1,000 dolphins! “They’re heading our way!” the captain exclaims, as he turns the helm to adjust our course a bit. The crew busily attends to the passengers, some of whom are also beginning to notice the splashes in the distance. A few pointed fingers begin a murmur in the crowd gathered on Marietta’s bow, those observations triggering more jubilant conversations farther back on the boat. Deciding that we are now close enough for our guests without binoculars to begin seeing the dolphins, I make an announcement over the boat’s speaker system. Yet, there are few words that can aptly describe what we are witnessing; this incredible sight of more than 1,000 dolphins swimming in a “mega-pod” is no illusion. It results from the intricate social behavior of these animals, which travel in large groups in response to a challenging life in the open ocean. Rare sightings of this grandeur cannot be guaranteed, of course, but like the shimmering haze on the horizon, can only be fully experienced by going to sea to appreciate our ocean ecosystems in all their complexity and beauty. Join Birch Aquarium for twice-daily whale watching cruises, now through April 15.